In Exodus 1 we find that the story of the Children of Israel takes a very sad turn after Joseph’s death. The new king of Egypt did not know Joseph and he was scared of the Children of Israel who were multiplying in number. This king decided to enslave the Hebrew people so they were not a threat to his kingdom. This was a sad time in the history of the Children of Israel. 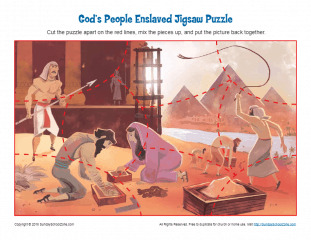 This jigsaw puzzle will help children remember how God was with the children of Israel even during this sad time.